In 1973 A new Team entered Formula 1. The UOP Shadow Team headed by Don Nichols, head designer Tony Southgate and drivers George Follmer and Jackie Oliver. 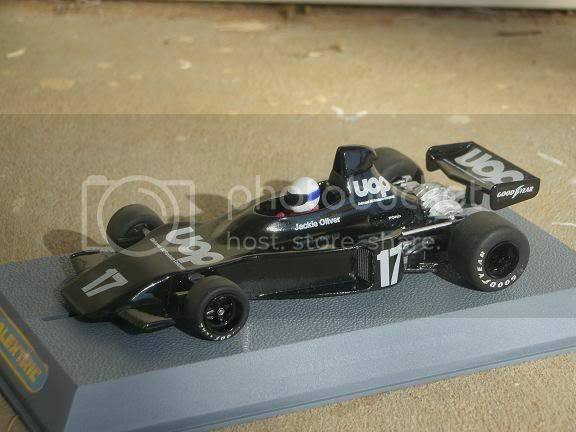 Their First F1 car was the very attractive DN1 Shadow and in addition to the team cars, a complete DN1 was supplied in kit form to Graham Hills Embassy racing team. Initially the cars were run with rear body work covering the usual Cosworth / Hewland running gear but this was soon discarded and the Drivetrain and rear suspension exposed. Despite some initial success where Follmer and Oliver scored Podiums, it appears the Design had a flaw. Southgate's lightweight F1 design principles had been developed at Eagle and BRM which both ran silky smooth V12 engines, the extra vibrations of the Cosworth V8 were literally shaking the DN1's to bits. and the cars were plagued throughout the '73 season. 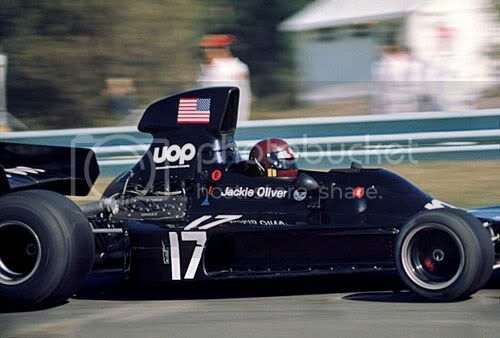 Hill's car which differed in many aspects from the UOP cars was especially prone and at the end of the season Hill abandoned the Shadow and had Lola build him a car. In my opinion however the DN1 was one of the best looking F1 cars ever. During 1974/5 Scalextric released their 1/32 slot versions of the DN1. 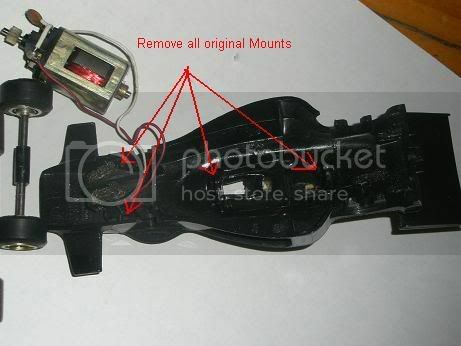 Initially the Shadows had a 2 1/2 mm square hole in each side as a result of a slightly different mount for the Johnson Motor but later after resorting back to a more conventional type mount, the holes dissapeared. They all had full rear bodywork around the engine and trans area as per the real DN1's in there initial form. 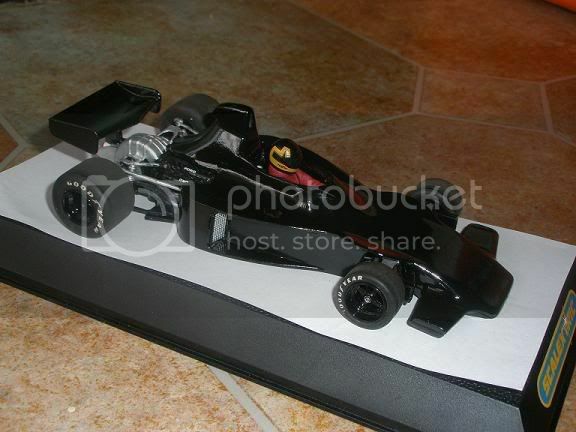 All the models were of an open bottom design with overly short wheelbase and minimal detail, although they were okay on the banked type of curve that came in sets at the time, they were pigs on a Flat curve, similiar to the M23 Mclarens,BT44 Brabhams and P160 BRM from Scalextric in the 70's. A few years ago Scalextric redid the M23 Mclaren and 312 Ferrari as good handling, high detail scale model slotcars, they were on a par with diecast models for detail. These were followed by Fly with the magnificent March 761 and we all rushed out and bought them, then came the Eagle and the Lotus 49 which lifted the bar even higher. What I really wanted though was a Shadow DN1 slotcar built to the high detail and which would handle like these new versions. Now I'm smart enough to realise that it was a bit of a pipedream, so decided to make my own. As someone of limited modelling ability and experience I thought that the Excellent M23 chassis was a good starting point, having excellent handling as well as a highly detailed Engine/Trans/Suspension package already there. As well as a nice set of detailed rims/brakes and Tyres. 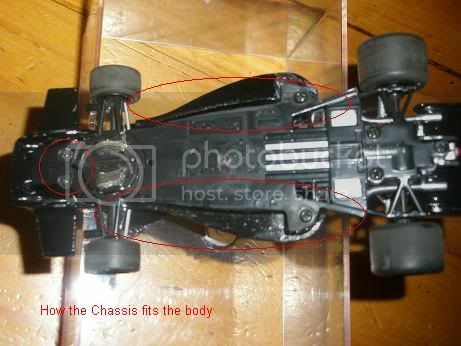 A rough measure of the original Scaley Shadow body showed that the front wheel area to the back of the airbox area, was more or less the same as the front axles on the M23 chassis to the back of the cosworth, it looked like as easyish conversion. First Job was to remove all the old motor, guide and wheel mounts from inside the shell, not as easy as it sounds because the old shells are made of a softish plastic that tends to melt slightly when You cut it so that has to be cleaned up by hand with sandpaper and small hand tools afterwoods, then I enlarged the area where the front axle originally sat in order to fit all that extra front suspension detail. Then to mark out and remove the rear body work ( mainly because It it this area on the scaley body that was out of whack to enable the wheelbase to be short enough to handle those 70's Scaley banked curves and secondly because I wanted to Model the late '73 DN1 showing off that lovely Cosworth and rear suspension detail) I left an extra bit of meat when using the dremel so i could do the last bit of trimming by hand a bit at a time, sitting it on the M23 chassis / Cosworth as I went until it fitted just nice, finally nibbling a bit of excess under the shadow air box area to sit flush on the Cosworth top. Next step was to study some pictures to look at where the cutout on the prototype car was on each side is to expose those Cosworth rockercovers. At the time of the build I could only find an early scalex shell with the square hole in each side, but as fate would have it they were an good guide to where the body work cut outs needed to be. So again working a little at a time I nibbled them out. Although the square holes were a good guide, they meant that the body cutouts were too long and the next step was to fill the original holes in with scrap plastic and epoxy, until the cutouts lined up with the ends of the rockercovers. Another test fit to the chassis and then it was time to cut out the cast in driver figure to enable the use of a full length driver from the donor Mclaren. Again this is best roughed out with the dremel and finished by hand. Finally any rough areas were filled with milliput and hand finished and the whole body was lightly sanded using 800 wet and dry. Until now all the cutting had been to what was really an old scrap shell but now it was time to trim the Mclaren Chassis from a perfectly good if well used car. Minimal cutting was required however and all that was trimmed was the extreme outside of the chassis, as it was I used the vertical area of the chassis tub as a guide and trimmed along that only leaving two small areas around the rear screw holes that were trimmed to fit neatly into the "hip" area of the body, the sides of the tub with a little sanding slipped perfectly into the inside of the shadow body and all the original chassis screw holes were used. At the front of the shell I epoxied a flat piece of rectangular plastic about 2/12 mm thick, sat the body on the chassis and scribed two points through the chassis holes, I then used a 1/8 drill and by hand made two holes in that plastic rectangle, taking care not to go through the nose of the body and then superglued two short pieces of styrene tube into these holes and after several trial fits trimmed the tube lengths to the desired lengths, the original screws were able to be used to secure the nose of the body to the nose of the chassis. For the rear/side mounts I screwed two lengths of styrene tube to the chassis through the original chassis holes and trial fitted and trimmed them until the body sat nicely. Then I put a dob of superglue on the tube at the body end (other end still screwed to the chassis) and refitted the body. Once the glue had set I removed the screws and took out the chassis and the mounting posts stayed in there desired position in the body, which I then reinforced using initially Epoxy but later built up around them using milliput for strength. I then tidied up any rough spots on the chassis and painted it black by brush at you cant really see it. Initially I thought about making a wing from scratch but in the end just sanded and painted the Mclaren wing, which came out quite good, the reasoning was that the original wing is keyed as well as scewed to the chassis rear and has all the rain light detail in the wing support, something that would be hard to copy. The original Mclaren full length driver went into his original spot on the chassis which lined up perfectly with the newly opened up cockpit of the Shadow shell. The body was then primed and sanded lightly and left to sit for several days. Then I warmed my can of gloss black in the sun (You can also sit it in warm water) this enables the paint to flow nicely with out spattering or being gluggy. Firstly a light coat on top and underneath and then a second heavier coat on the underside and then finally a second and third coat on the top, each type of paint is different, but I found that You either have to recoat within a few minutes or wait 24 hours. The trick is to get it warm like I said before and to practice on some scrap first to see how Your particular paint works best. In the end I got a really deep glossy smooth finish which i was really pleased with. A final touch was to trim the radiators from the M23 and fit them to the Shadow's side pods. Not entirely prototypical but it looked good. Now Patto, God Bless Him, has been knocking out obscure decals for We slotheads for Years. He now has a new system that means his decals are easier to use and not as fragile. 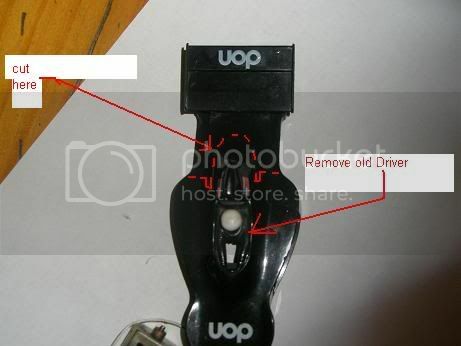 You still need to be careful but because they still aren't as user friendly as the ones in the commercial kits and you still need to cut them out, However his sheets always have multiples of each decal so if You stuff one, there are spares. If You follow his instuction sheets and have a practice with some that You wont require, You'll do ok. If You go in at a million miles an hour it will go pear shaped. So onto the Pattos website, and there listed are the exact decals for the 73 UOP Shadows, once they arrived the paint had well and truly dried, again this is important, as You dont want to rush now. So I had a practice run and followed the instuctions, then sat down applied the decals to my car, usally it's best to do one side and then later on the other, but as this was a pretty basic livery I did the whole lot, I had one mishap on the rear wing, but simply removed it with a cotton bud and used one of the spares supplied. Initially the whole thing looked a million bucks, but as the decals dried I realised that the clear surrounding bit of each print became really obvious, and I went into panic mode and got onto the Outhouse forum squawking for Help. I had 2 Problems, the first was that the decals themseves and the clear area around them are not superglossy, and I'd outsmarted my self by producing such a glossy finish on the paint that the decal surround was showing up as a semi matt finish. The second problem was the dark black made the first problem worse. After both Jordan and Phil made some suggestions I felt better. I left the decals to sit for several days and then when I was sure they were right I got the missus to track me down some longlife floor polish, now Patto again Helped out by emailing me an article on the best way of applying this. Initially I just put it over the decals, it's self levelling and if not put on when the ambient temp is too warm it comes out nice. In the end I put 3 coats of it over the whole body using a modelling brush, I swear it looks like it's been sprayed with clear, I reckon a bottle will do about 500 cars and it costs about 5 bucks. The good thing is that if You stuff up it can be removed with window cleaner. It dries rock hard and if it chips you can touch it up and the self levelling properties will make the touch up virtually undetectable. I know that most blokes would just clear coat their cars with clear acrylic but I chickened out at the death knock and went for coating the whole car in longlife, that way if it went pear shaped I could save it with the aformentoned windex rather than a complete paint strip.. In the end it came out glossy and level with no brushmarks at all and the only decal you can see is the print, no surrounding area is visible. This was my 1st Scratchbuild / Facelift what ever You want to call it. I am very pleased with the results. The car looks right at home next to the new scaley/ Fly classics and doesn't look dated and Toylike anymore. Also it runs on a par with the Scaley Mclaren and 312. Phil asked me to do a little write up and along with some nice comments from some other blokes (including Buzzard who said "Jackie O would be proud- Oliver not Onassis but she would be proud too". So I feel quite chuffed that others thinks it's pretty cool too. Living in the country now it's quite hard to get out and race at the usual spots in Perth, but this building your own thing is good fun too. Everyone should be doing it. Excellent article Ted, between you and Jordan I feel under threat! What are you like at race meeting write ups!! 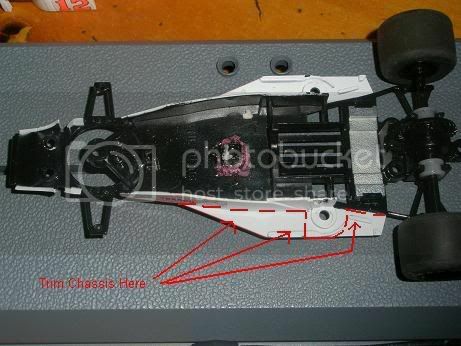 I have always extolled the 'true scaledness' of the Scalextric early F1's. The Tyrells are one of my favourites, maybe I need to review my scratching agenda?? Seriously though, the model looks fabulous and the conversion looks sound from where I'm standing. Its nice to see a scratchbuild without blocks of wood inside it and pins going into or through the sides to hold the chassis in! I look forward to the next!! Mmmmmmm?